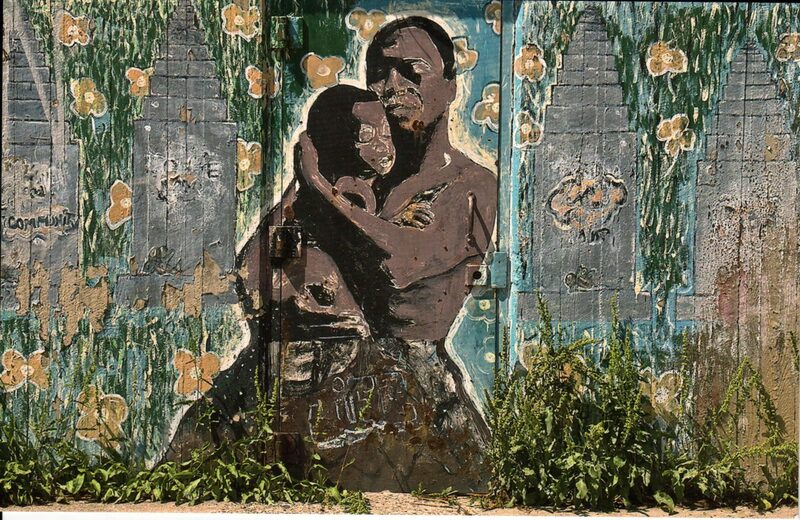 ‘Streetscapes” by George K. Arthur is a collection of 22 color, often very moving and sensitive images of Buffalo graffiti. “For many years I noticed when someone in the neighborhood would paint their feelings or make an R.I.P. image on various buildings in full view for everyone to see. At first, I like so many others, classified it as graffito without really taking a good, long hard look or thinking about the person who drew or painted it. One day I stopped and took a long look, and began to wonder about that person, did he or she ever have any formal training or did they, like so many other people that I know, just have raw talent. What where they trying to say when they drew what I call a RIP image – with the colors, the composition, the feelings and the message they where sending to all passers- by. George K. Arthur is a native of Buffalo. George’s primary education was completed in the Buffalo Public Schools, at School 32 and Seneca Vocational High School. At Seneca, George majored in photography. He was the first African American, in the school, to graduate with this major. Following graduation from high school, Mr. Arthur was drafted in to the US Army in 1953. He served in the Signal Corps for two years and received an honorable discharge in 1955. During his tour of duty in the service he continued to develop and nurture his photographic skills. Following his discharge he returned to Buffalo and completed his B.A. Degree, in Political Science, at SUNY Empire State College. Arthur’s early employment included time at PhotoTech Studios where he worked as a photo technician and was able to advance his photographic ability. Later he went to work for the New York State Office of Drug Abuse as a Narcotics Counselor at the old Masten Park where he remained until he decided to enter the world of politics full time where he had a long and illustrious career beginning in the early 1960’s when he was elected as a Democratic committeeman, then onto offices with the Erie County Board of Supervisors, Ellicott District Buffalo Common Councilmember, Buffalo Common Councilmember-at-large, and lastly, President of the Buffalo Common Council, a post he held from 1984 to his retirement in 1996. In 1985, as one of only three African Americans to ever seek the office of Mayor in Buffalo’s history. At that time, George K. Arthur ran for Buffalo City Mayor as the endorsed Democratic candidate. Faced with a three-way race, Arthur narrowly lost to the incumbent, James D. Griffin. An admitted “jazz enthusiast”, in 1989 George K. Arthur was a major force in creating the Pine Grill Jazz Reunion one of the City’s most popular and well-attended outdoor musical events and takes place in Martin Luther King, Jr. Park on Buffalo’s East side. Currently, George serves as the President of the Michigan Street Preservation Corporation. Under his leadership, the Corporation has preserved and re-opened the Rev. J. Edward Nash, Sr. home as a museum, research center and heritage tourism center. George has received numerous awards and recognitions such as the Red Jacket Award from the Buffalo and Erie County Historical Society, the NAACP Medgar Evers Award; the YMCA Jackie Robinson Award and the Buffalo Urban League Evans & Young honors. But no matter what was going on in his life, George K. Arthur never relinquished his passion for photography. He spent time developing and perfecting his craft and his works have been exhibited in numerous area galleries including: Nina Freudenheim Gallery, CEPA gallery (where he also spent time on the Board of Directors including serving as Board President), Burchfield Penney Art Center, WNED, Buffalo Niagara Convention Visitors Bureau, Main Place and the Greater Buffalo International Airport gallery.